Cold rainy weather means the soup pot is coming out of the cupboard. 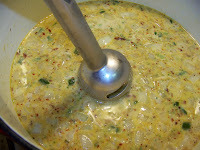 This spicy broccoli and cheese soup with bacon was a big hit with my family because it was light, creamy and perfect for this gloomy day. 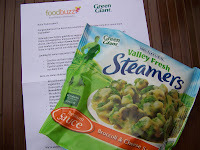 My idea for the soup came about when I was given a coupon to try Green Giant Valley Fresh Steamers through the Foodbuzz Tastemaker Program. It didn't take me more than a second to see the Broccoli and Cheese Sauce package in the frozen food aisle at my grocery store and know this soup was for lunch. 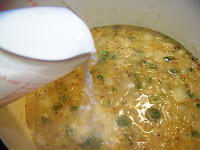 I was thrilled because the soup came together in a flash and the smell of the soup and bacon wafting throughout the house made the rainy weather almost welcoming. I served the soup in bread bowls for some fun. We all had a great time ripping apart the bread and dunking in the soup. I usually say "rain, rain go away", but with this soup around I don't mind the rain so much. It's just makes me want to eat a second bowl. Bread for dunking or bread bowls. 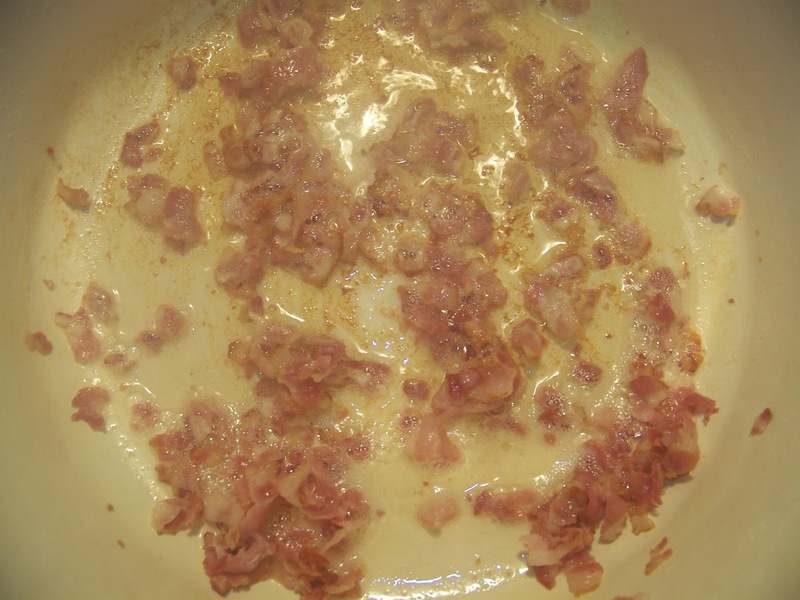 In a soup pot, brown your diced bacon until crispy. Drain bacon out of pan and set aside until later. 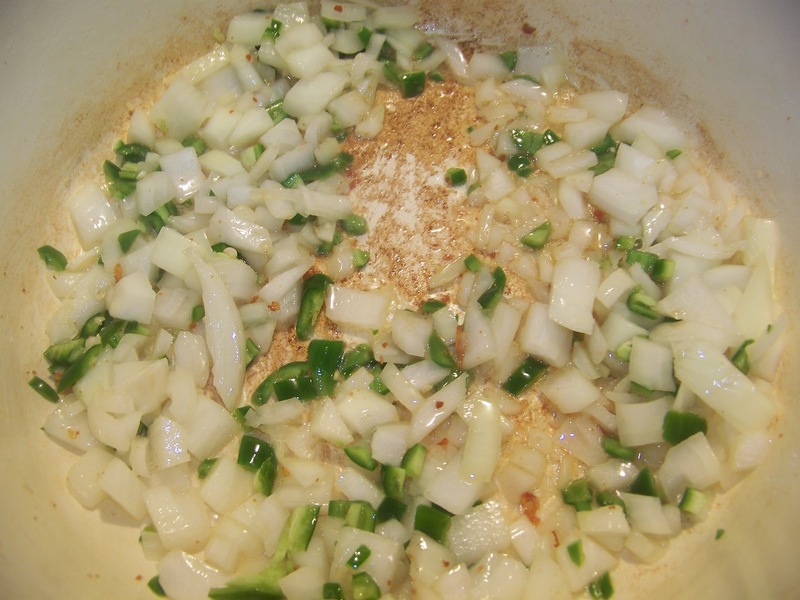 Then add your chopped onion and green chilies to the pan and saute for 1-2 minutes. 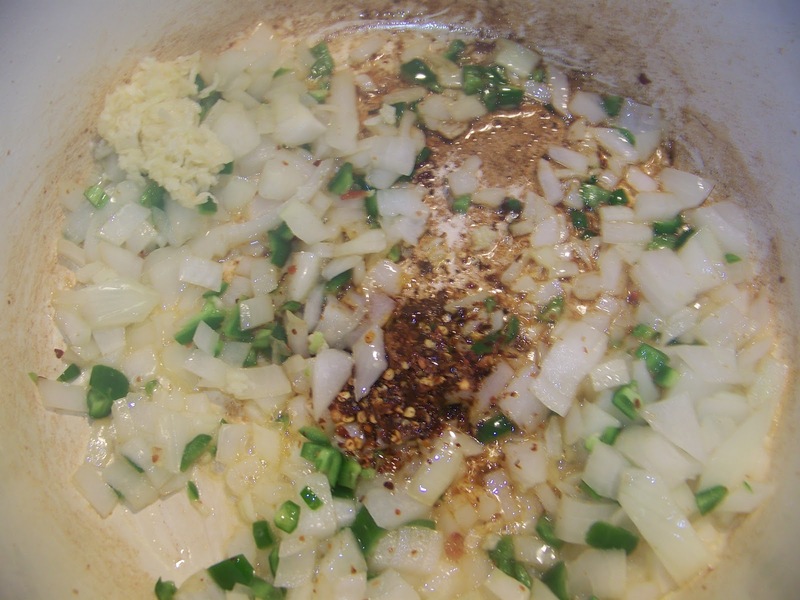 Next add your red chili flakes, grated garlic, 1Tbs of flour and your 1/4 tsp of poultry seasoning and saute for 30-45 seconds. Then add your 4 cups of chicken broth and the entire bag of frozen Green Giant Broccoli and Cheese Sauce. Bring to a boil. 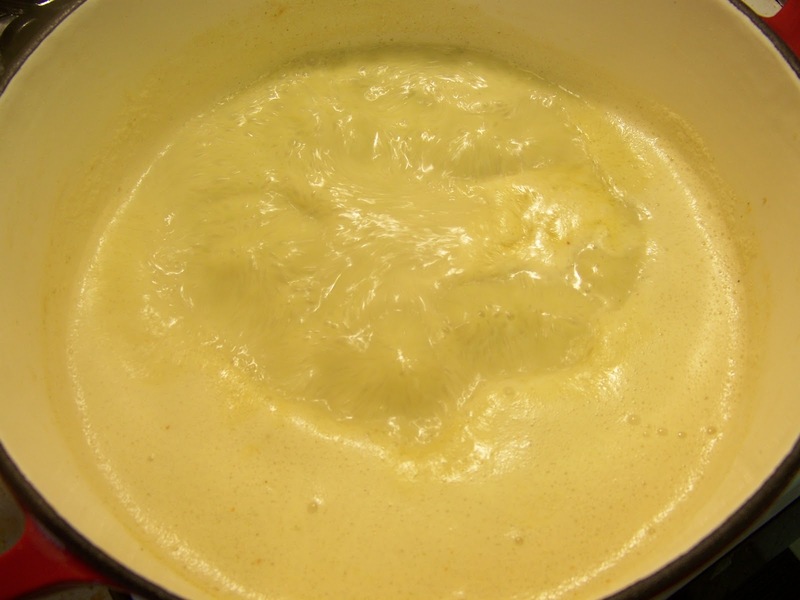 Then pour your milk into the pot and stir in your shredded cheese. 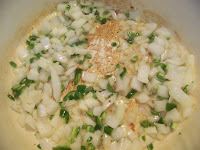 Stir well and allow the soup to boil. To cream the soup, use either an immersion blender or transfer in small batches to a blender. I definitely recommend the immersion blender because it's very easy. 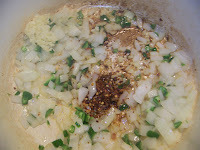 Allow the soup to boil and thicken. Taste for seasoning. 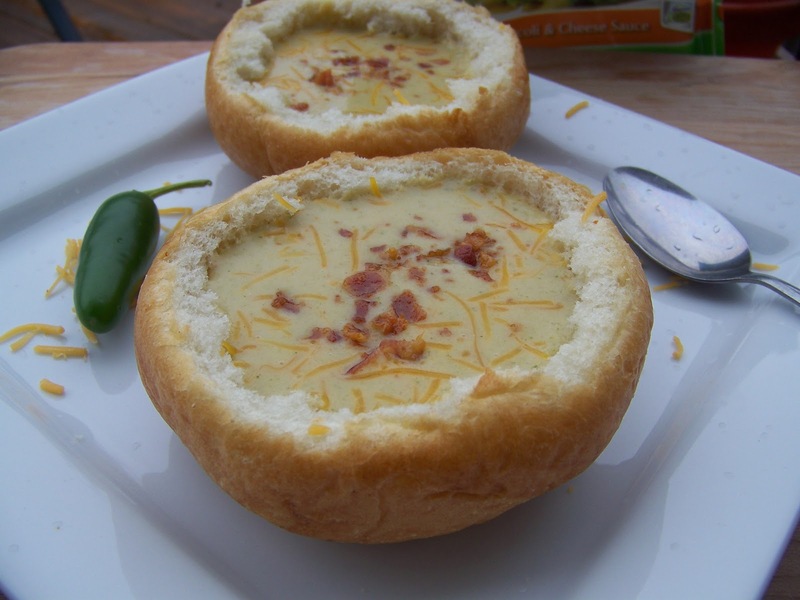 To serve the soup in a bread bowl, take a large round roll and cut a thin layer of the top off. Then use your fingers to scoop out the inside of the bread to form a bowl. Make sure you leave enough bread at the bottom to prevent leaking. Serve with bacon bits. Serves 4. 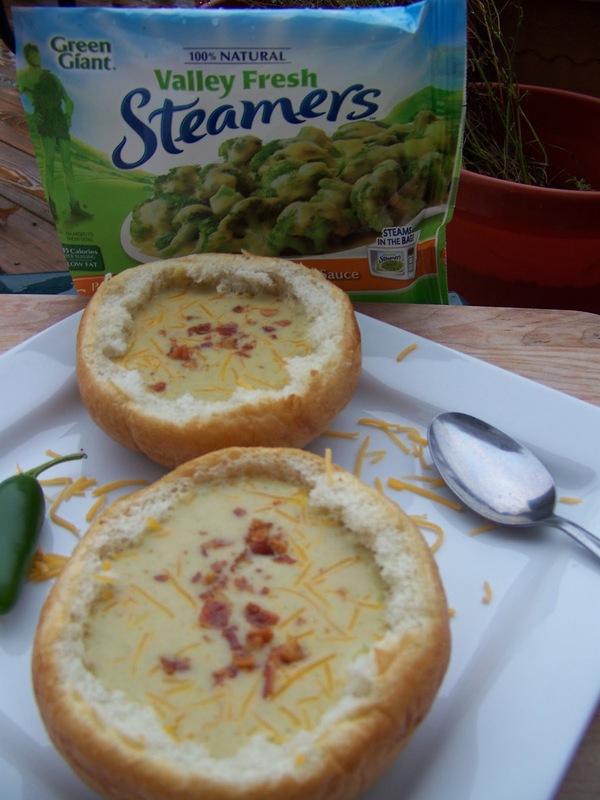 Serve with bread or in bread bowl. Garnish with more cheese and the crispy bacon bits. 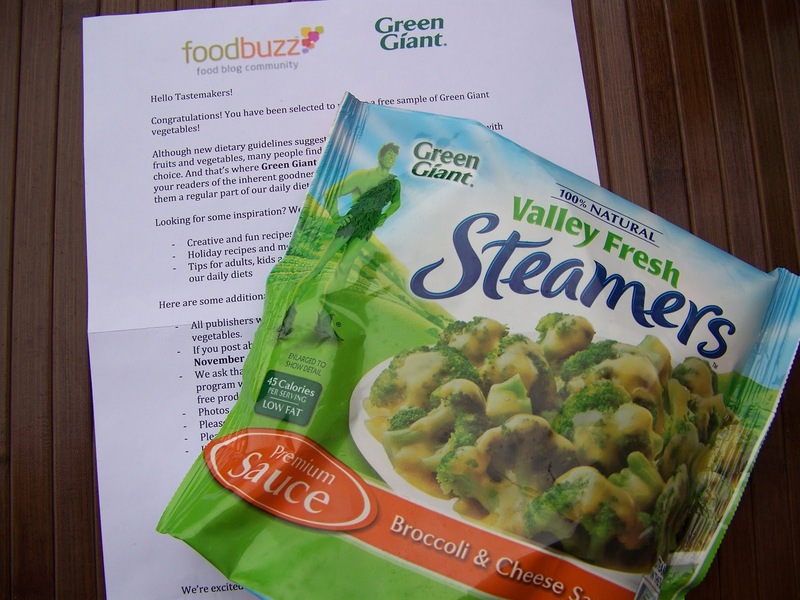 Disclosure: I received coupons from the Foodbuzz Tastemaker Program courtesy of Green Giant. I was not compensated in any way for writing this post. The opinions stated in this post are my own. Thank you. Your soup sounds delicious and what a clever presentation! I wouldn't mind the rain too if I had this soup. 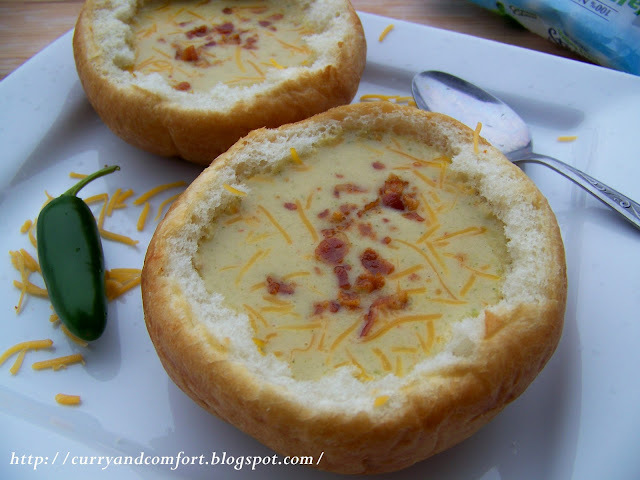 Cheese and bacon in a hot soup, delicious! How cool! I would have NEVER thought to make broccoli soup with a bag of cheesy broccoli! Nicely done - as usual! 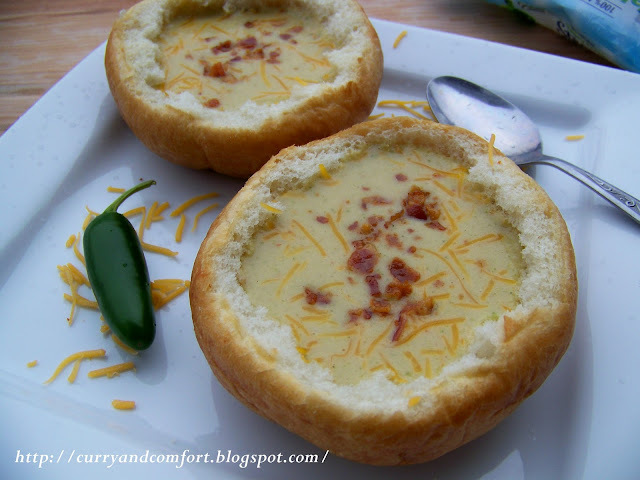 Mmm, nothing like a breadbowl soup! 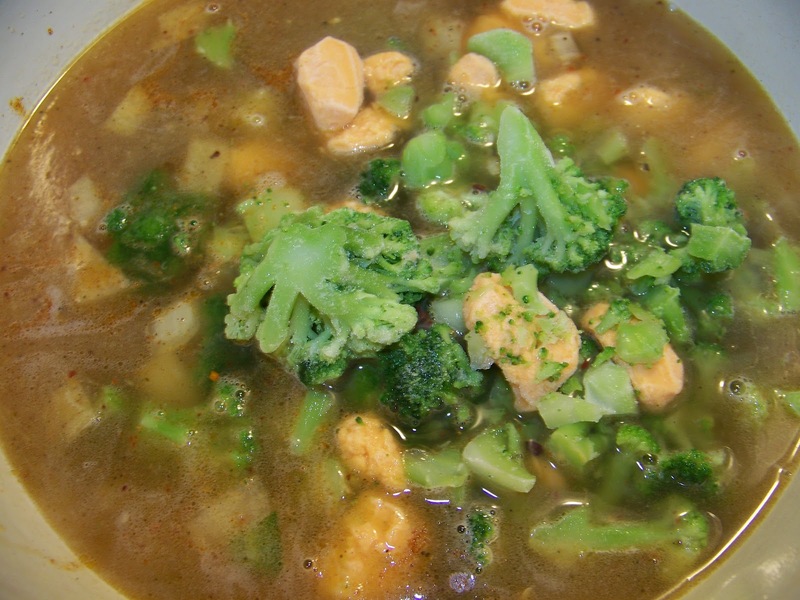 I love how simple this is with the steamed broccoli. I love a good cheese-soup, I'm sure I'd love the spicy twist. 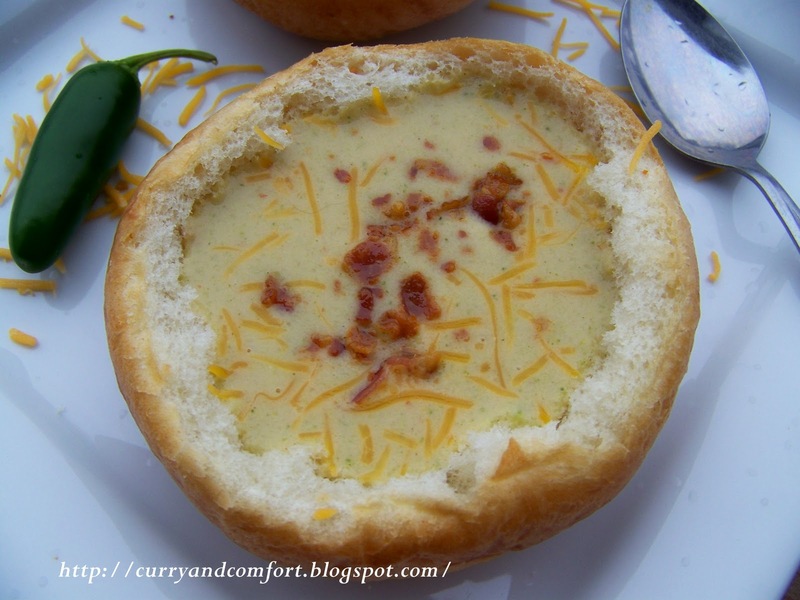 I LOVE soup in a bread bowl--and yours looks so hearty! Broccoli and cheese soup is one of my weaknesses! I am ready to dig right into this! I have a weakness for broccoli and cheese soup that few people know about. An old friend's mom would make it for us and I often hope she'd invite me for dinner on the nights she just so happened to make it :) Yours looks creamy and delish! Slam dunk on this one for sure! I would have a ball demolishing that bread bowl. Great recipe and presentation. OH yeah. This is a major winner. Supergood idea! Your family must have been seriously loving you for making this for dinner. 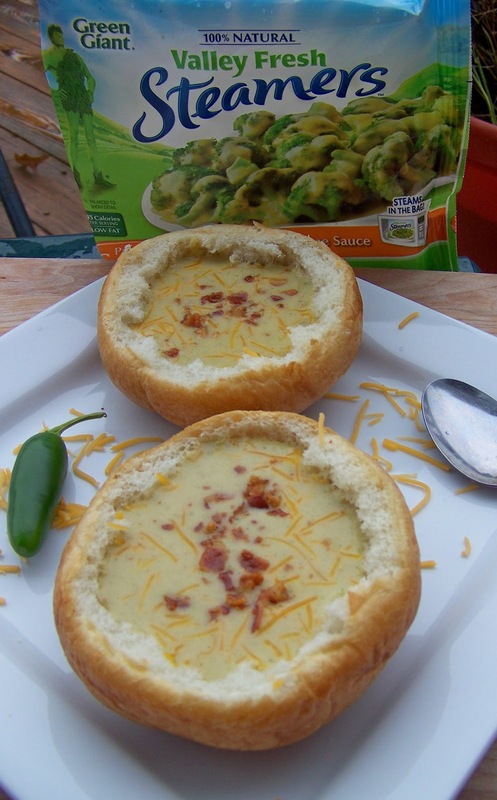 Brocolli cheese soup AND in a breadbowl? Wow!! This is exaclty what I'm craving now. I love that you added that little tip about the bread bowl. The first time I put dip into bread, I hollowed out too much of it. Twenty minutes into the party, the dip leaked everywhere! Live and learn right? I love broccoli and cheese soup! And I love the addition of the red chili flakes and the bacon-so creative!